Details: 2 raw meal silos constructed in 1983 for a capacity of 5500 MT. The 15 meter diameter silo is 33 meter in height. 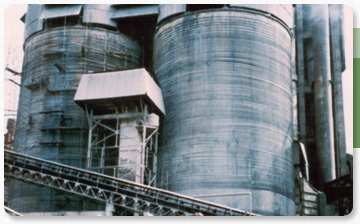 Challenge: The 2 silos had suffered heavy damage due to vertical cracks and spalling. It was also observed that the circumferential reinforcement was not adequate. Solution:	216 full-size circular mono-strand cables were provided and anchored using Freyssinet special connectors. The strands were housed in suitable HDPE ducts with a layer of grease. 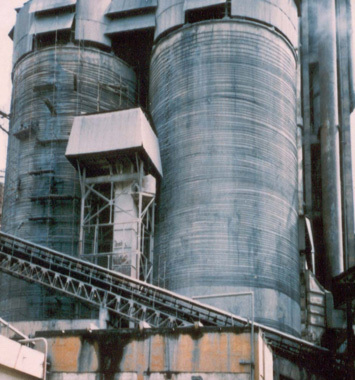 The assembly of strand and pipe was housed in bigger HDPE ducts and the inter space was grouted with neat cement grout, thus providing comprehensive protection to the prestressing steel.